Home » Uncategorized » Is every Island going to be more beautiful than the previous? We are currently en-route to Brampton Island from Scawfell Island, motoring in very little wind, but beautiful sunny weather. In the end we only spent the one day at Middle Percy because we got itchy feet – always another island to see! We greatly enjoyed the hospitality of the Homestead and then were lucky enough to get an impromptu invite to Steve’s tree-house on the beach where we had delicious goat stew (freshly shot by Steve) with Tim and Greg and Donny. 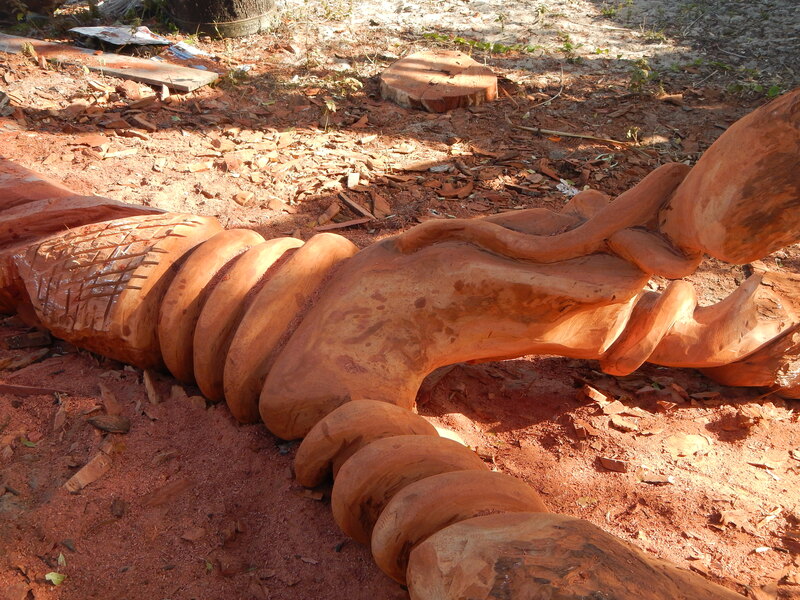 Greg is an artist who is completing a beautiful carved sculpture totem pole to be erected in front of the club. Next morning we found a place in the club to hang Lyn’s beautiful JoliFou memento which she had created the previous day. In my somewhat biased opinion, it’s one of the best on show now, and appropriately is placed under a Perrier-Jouet champagne bottle as per used in our boat renaming ceremony. Late morning we departed for Digby Island, a short 20 mile passage. The run to Digby was very pleasant, square before the wind, full sails, poled out jib in about 15 knots. Digby island is pretty enough with a nice beach and a quiet anchorage, but not quite the grandeur of some of the other islands. 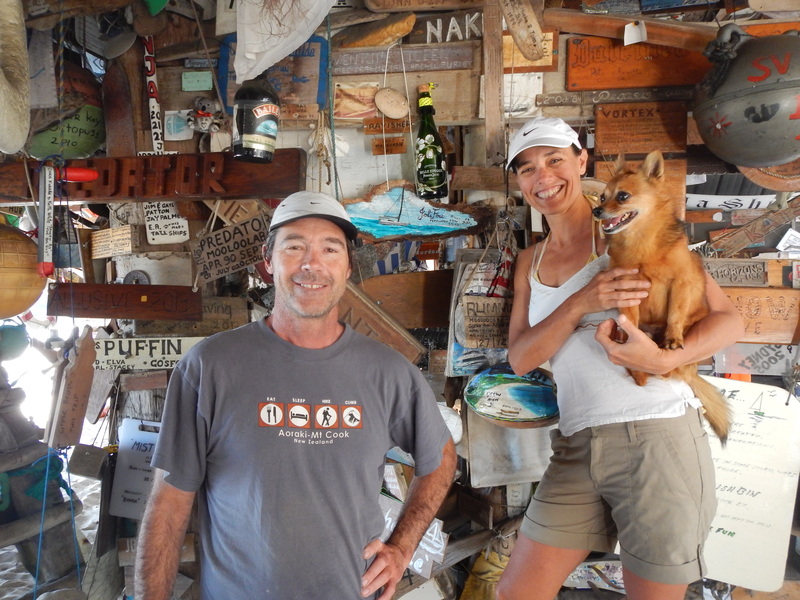 Our new friends James and Leah of Mahiti and the schooner Argos were the only other occupants. We had a brief fire on the beach followed by drinks on the beautiful Amal 46 Ketch, Mahiti and were generously gifted some beautiful mackerel fillets from the fish that they had caught during the crossing. We had been less successful, although we did have a fish on the line briefly, but it managed to free itself from the hook whilst we created a huge tangle in the reel (we are hopeless at fishing). Not having launched the dinghy yet at this stage, we had a pretty hectic drunken paddle on the standup boards back to the un-lit JoliFou in the dark. although not enough wind to use it, it is now ready to go. The highlights of the trip were when we arrived at the North East side of Scawfell. 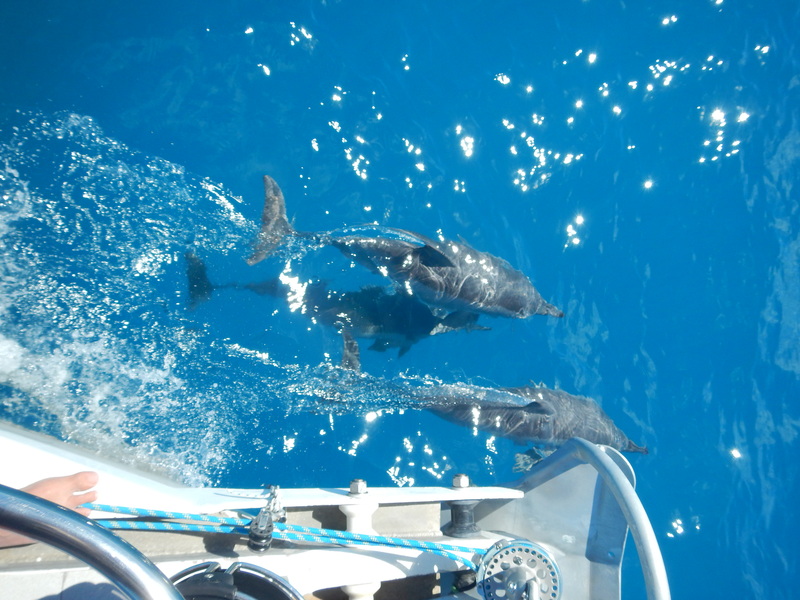 Firstly we had some dolphins come and play around the bow, with Lyn snapping photos furiously and Silus barking madly (as he does EVERY time we see dolphins or whales). Best of all was the majestic rock cliffs on the North East shore, which we motored around very close in. This place could be a climbing mecca, we saw so many amazing rock climb possibilities, huge slabs, corners, cracks all on what looks like superb rock. Refuge Bay at Scawfell is an excellent anchorage in the South Easterly winds, with stunning white beaches below the heights of the land. Is it possible this is even more beautiful than Middle Percy? After the obligatory sundowners on the beach, we had James and Leah and the kids (Ewyn and Hamish) over for dinner, cooking the beautiful mackerel – yum! Cruising has been described by friends of ours as “working on the boat in beautiful places”. During the trip to Scawfell we discovered a large amount of water in the bilge. Alarm bells!! After the initial panic receded we realized it was fresh water, not salt. A leak in the tank!? Investigation discovered that it was a hole in the piping of the galley sink tap, so our water pump had been diligently spraying 300 liters of water out inside the cupboard under the sink and our bilge pumps had been diligently doing their job, pumping most of it out into the sea, lovely. If we were not motoring we would have heard the pumps and turned off the water pump before losing all of our water. Fortunately we had an entire spare tap on board, including the pipes, so I was able to replace it all remarkably easily (which is usually not the case with boat jobs). Whilst the tools were out Lyn requested that the stove top be repaired too – an entire galley make-over in only about 1 hour! 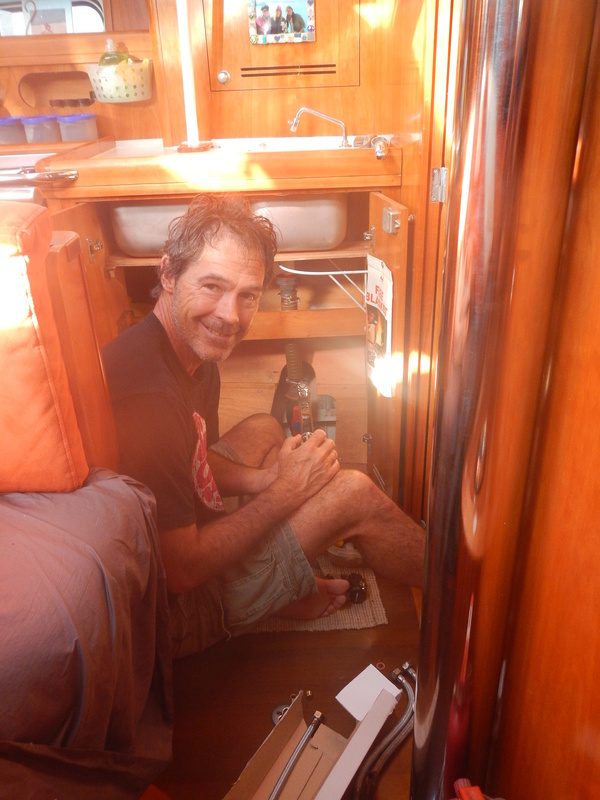 After making water for a while and Lyn pumping and sponging out the water from the places that didn’t get to the bilge, the JoliFou was back at 100%. The wind had turned to the North, though still light, but with a forecast of 15 knots from the North West that night, we decided to head for the next Island, Brampton only 18 miles away, which has a very good anchorage for Northerly winds. We motored for the first 2 hours then enjoyed a nice reach for the last hour in the building North Westerly. Another amazingly beautiful place, more beautiful than the previous ones? 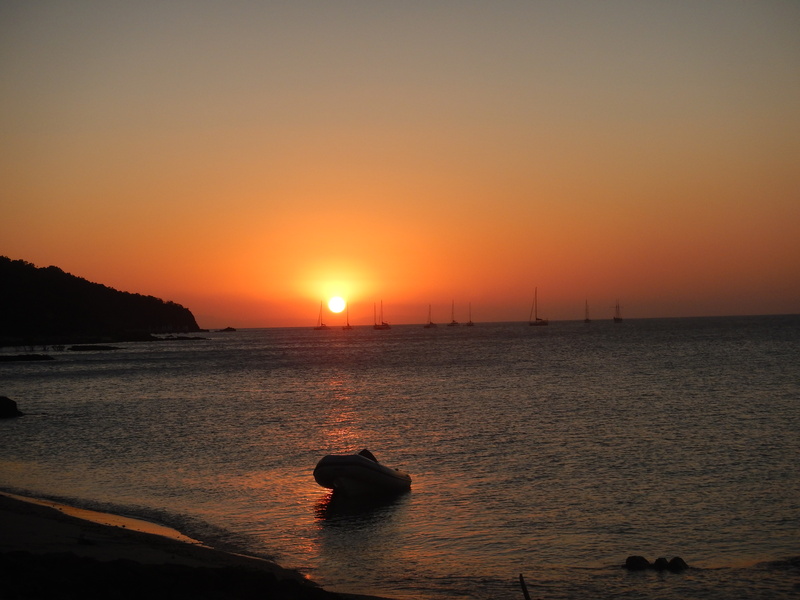 The jury is out, but what seems clear now is that every island has its own charm and beauty. 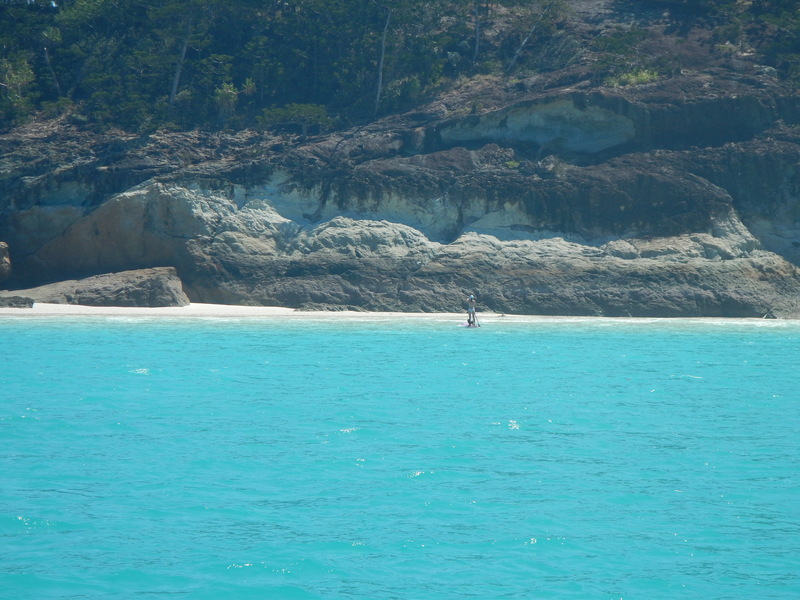 Dinghy Bay is extremely pretty, with rocky shores and pine tree covered hills all around. We launched the dinghy for the first time and managed to get the outboard on with a bit of a struggle before going to the beach for our arrival sunset drink. Popping in at Mahiti on the way back, the kids invited us to dinner (I think Mom and Dad were agreeable too?) and we enjoyed a great night of dinner drinks and chats with our new friends before retiring to JoliFou after cruiser’s midnight (8:30 PM). Brampton Island has a number of good walking tracks courtesy of the enemy (Parks Board) and we might go for an explore later, unfortunately without Silus. We have had him on the beach here with no problem, but we are not quite outlaw enough to take him into the interior as he may “frighten the indigenous animals so that they get lost”. Clearly our outlaw dog had already irreparably destroyed the ecosystem here because we spotted some turtles that must have been lost and not able to find their home at the adjacent Turtle Bay. Plans changed yesterday due to an un-predicted return of the South East trade winds. After a lovely swim on the beach and scramble/climb up a rock out-crop to enjoy the view, the building wind forced us to up-anchor to get off the lee shore. 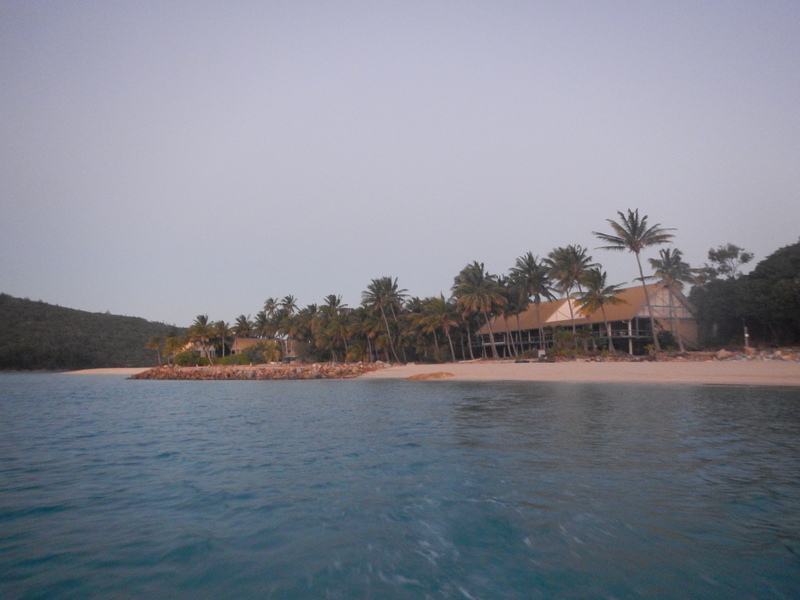 A pleasant short sail with jib only around the island saw us arrive at the pretty Pelican Bay on the North side. The bay is close to the Brampton Roads which is a shallow coral/sand bottom waterway between Brampton and Carlisle islands. There is a resort here, which has been closed down, but is still in quite good repair. It is quite weird to walk on the beach by the resort and there is a ghost-town feel to it with an air-plane run-way and fully furnished units, but all just a touch past their best. I was excited to realize that the strong wind and the lagoon-like area of Brampton Roads was a perfect kite-boarding location. James from Mahiti is also a kite boarder so I picked him up in the dinghy and we headed over there with our gear to give it a try. We ended up having a great time in a perfect setting, enjoying an afternoon of perfect kiting, which was totally un-expected. Today is 1 month since we left the Pittwater and we will arrive at Airlie later today. A long time for a trip? Actually we arrived at our destination a long time ago. Since our first Island at Lady Musgrave it has felt like we are truly on holiday and not like a journey, except perhaps in the spiritual sense as we relax more and more into the natural beauty we are surrounded with. I am writing this as we lie at anchorage in refuge bay, Nara inlet, on Hook Island. There is a strong Easterly wind blowing and the boat is still at times, then suddenly jerks to the will of a large bullet of wind. We are right inside the top of the inlet and surrounded by high rock and trees. Before departing Brampton Island we went for a long walk with Silus (don’t tell the enemy) mostly in the area of the defunct resort. It is such a strange situation. The resort has been closed down for about 3 years now and most of it is in really quite good shape. The rooms are still fully furnished, with lounges, beds, bar fridges and televisions. There is a gym with exercise machines, weights etc., golf clubs, catamarans on the beach, wetsuits hanging up in the watersports area, tennis courts with nets up looking quite good, a de-salination plant and a huge aircraft runway. 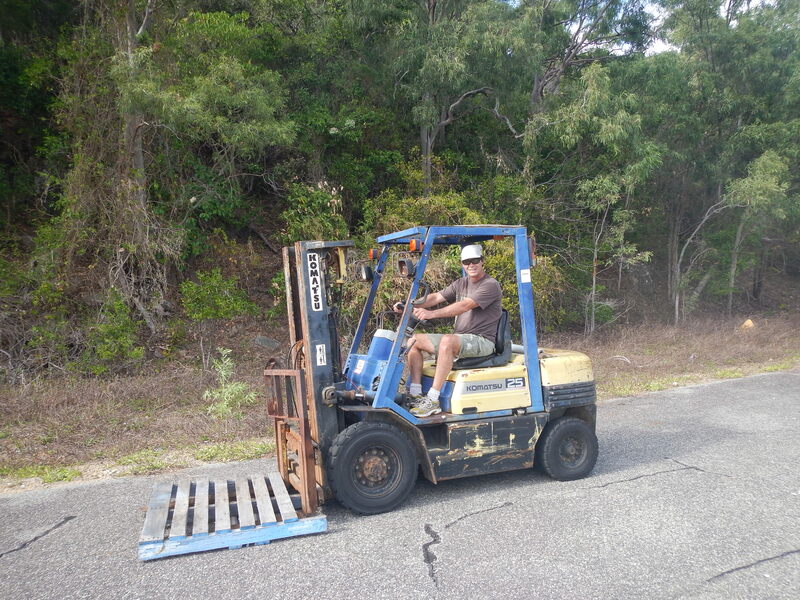 A forklift is parked out in the open, slowly rusting away. All of this and the only occupants are kangaroos, no sign of any security or caretaker. 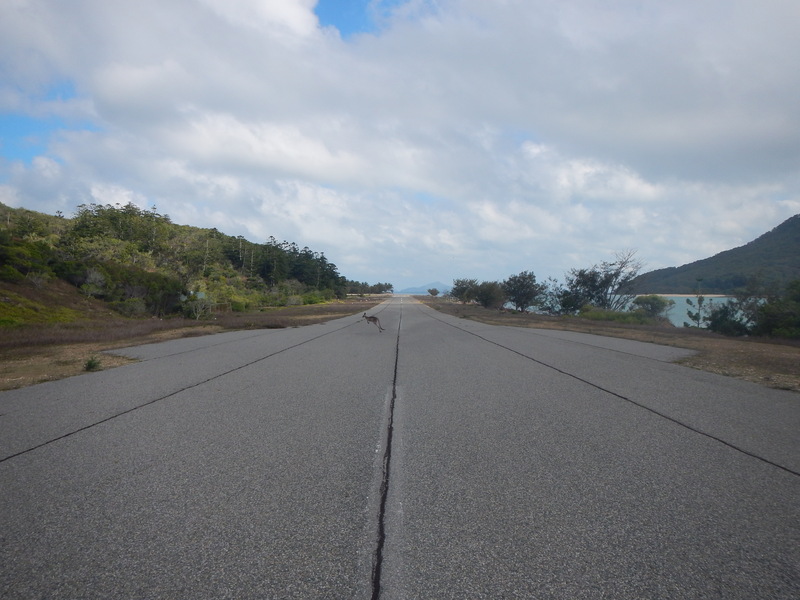 Lyn took some good photos of kangaroos on the runway, which we hope to sell to Quantas for thousands of dollars. The next destination was Thomas Island, just 18 miles away. We anchored in the bay on the South side near Dead Dog Island (eek) due to the forecast calling for the wind to go North East overnight. Another stunning bay, with just us and Mahiti in residence! It was initially nice and calm, and the Mahiti crew came over for a delicious slow-roasted lamb dinner, embellished by James’s birthday bottle of fine red wine and finished off with Leah’s delicious lemon meringue pie. Who said cruising sailors need to rough it? Later, a nasty little Easterly swell started getting into the anchorage. The boats were rocking and rolling like crazy, no real danger but just discomfort and wear and tear on everything that was creaking and groaning as the boat moved. I had a brief sleep, Lyn had none and at 3AM we decided that enough was enough. Raising the anchor in the pitch dark was only slightly assisted by a tiny sliver of rising moon, but it was a hectic time, with the boat pitching and rolling in the waves until we were out of the bay and able to steer with the waves. 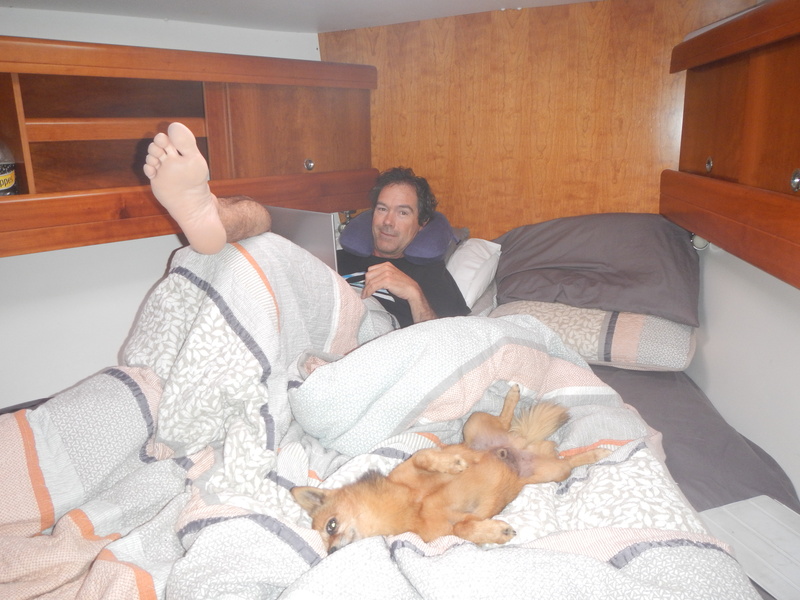 Lyn went to try and get some much-needed sleep whilst I motored down-wave until we were able to get under the lee of Thomas and later Shaw Island. 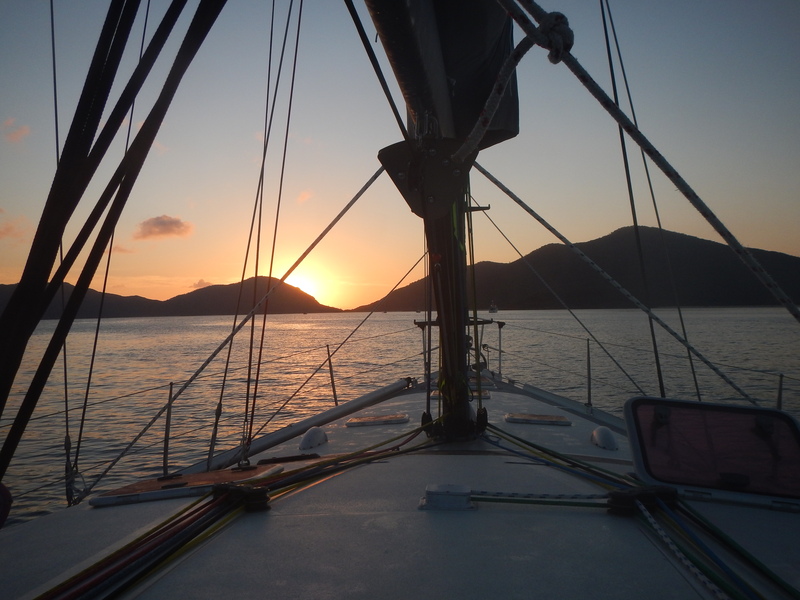 At first light we found a lovely and completely calm anchorage inside Burning point at the Southern end of Shaw Island – time for a sleep! Around mid-morning we awoke and decided that sleep could wait – exploring needed to happen. We upped anchor and used the strong ebbing tide to sweep us Northwards through Kennedy Sound, marveling at the beauty of Lindeman and Shaw Islands and later the majestic Pentecost Island (another great rock climbing location?). 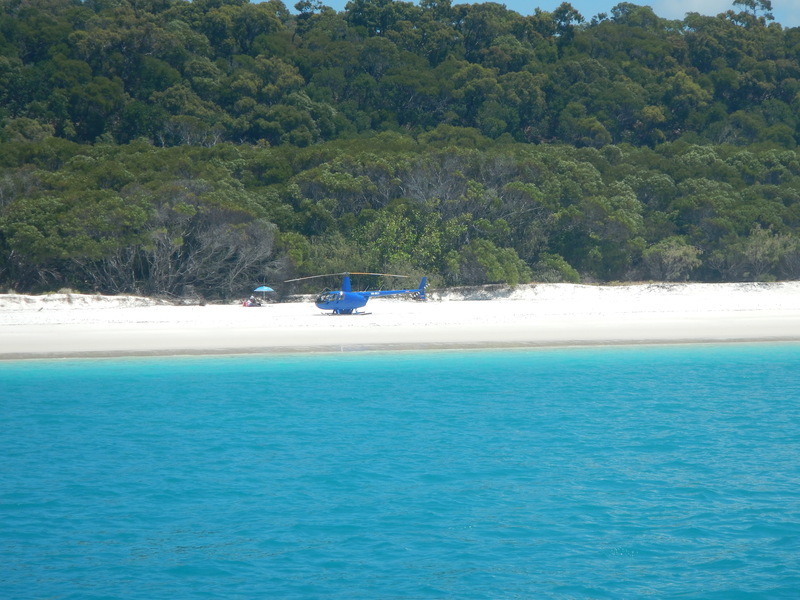 The plan was to go towards Airlie beach but by way of a detour past Whitehaven Beach. Whitehaven is everything we have heard and read about, a glorious long glistening white beach with navigable depth almost to the sand. The Southern end was quite crowded with yachts and motor yachts, not really our cup of tea. We sailed with jib only slowly down the full length of the beach, spotting two helicopters on the beach and one wedding. Yes indeed, it seems the enemy allows you to land your helicopter on the beach, but a little dog would destroy the environment! No dog on this paddle board! Arriving at the gorgeous Hill Inlet area we decided to anchor just off the beach and have lunch there. Lyn snuck Silus ashore on the standup board and fortunately there were no objections from the few people on the beach there. I hope we have not irreparably destroyed the place? There were a few boats right inside Hill Inlet, which is a sandy area that dries at low tide. I am quite keen to return and do that with the JoliFou, and also have a kite off the beach there next time it’s windy enough. We will no doubt return here soon, but we needed to find a quiet anchorage sheltered from the building Easterly for the night, so we set sail for Hook passage and onwards to Nara Inlet. As we post this, we have just arrived in Airlie Beach at Abel Point Marina, looking forward to a little bit of luxury. Showers, laundry, get rid of the rubbish, spray the boat down with fresh water, collect stuff we’ve had delivered to the yacht club. Stock up on food and drink, most urgently we have run out of beer and coffee! Airlie looks like a charming place, but I will post more on that later when I’ve had a chance to look around more. By jolifou in Uncategorized on September 21, 2014 . Hi Merle. I’m very pleased you’re enjoying it thanks. Maybe you should publish those diaries? What do you think of the green bags Lyn? Do you think they make a difference? Hi Kel, you would be amazed at the transformation of my little man 🙂 old dog… new tricks who would have thought! Green bags are amazing! Two weeks in from last farmers market and I ran out before they were off! When are you off on your adventure? Hi Bruce and Lyn. Lovely to read of your adventures and open our eyes to what is out there awaiting should we be that brave. Bruce those blogs are amazing and well done Lyn on your beautiful painted gift – definitely the best by far of all the treasures left there……. Enjoy Airlie!!!! !